I caved. I folded. I fell off the wagon. I have lost all respect for myself. If you have any faith left in me as a human being, discard it now. I'm a low down dirty rat. It started innocuously enough; just a quick glance over the crimson and golden aisles in the supermarket, a short peruse over the Christmas goodies. I'd promised myself that I would resist, at least until November was out of the way. I intended to enjoy the month for what it was rather than a period of time that wasn't quite Christmas. November has a great deal to recommend it normally, its the only bit of winter that I really enjoy. After Christmas winter is just miserable, my bones are tuned into smallest inkling that Spring is on the way from New Years Day onwards. November though, with first frosts and getting wrapped up on cold crisp mornings with the thin winter sunlight warming your face, is a joy. Alright, so a joy is probably a bit strong, but it is quite fun kicking through piles of leaves, seeing your breath and coming home to cosy warmth and mugs of tea. So, as I was enjoying the prospect of Winter, my hand reached out absently and picked up a box of mince pies and before I knew it they were in the basket. Now, there's a funny thing about mince pies. I don't actually like them all that much. The girlfriend adores them. Oddly, any food to do with a particular holiday she seems very keen on. Hot Cross Buns are a particular favourite. Anyway, I don't like mince pies. I love the idea of them. The rich fruit, the crumbly sweet pastry. It's always seems like it should be such a sure fire winner. 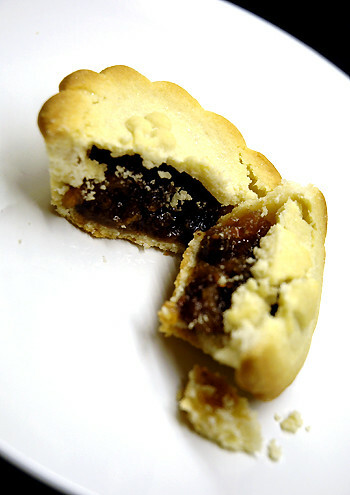 But, somehow every year I get all excited by the prospect of a mince pie and have those hopes dashed. Give me a pannetone or some stollen any day of the week. In fact, much of the food that I am looking forward to over the Christmas season I have a sneaking suspicion that I don't actually like that much but feel compelled to over indulge upon. I have a very addictive personality. I am constantly having to give stuff up for fear of the damage it may cause; smoking, recreational drug use, Battlestar Galactica, baking scones, the list goes on. I'm terrible with things that I crave. If I have them in my possession I absolutely have to eat, smoke, drink or whatever other activity is necessary to consume them. If they not around, I don't think about them at all. So when Christmas comes along I'm every so slightly fucked. However, this year I am determined not to get caught up in the whole thing too much. Looks like I have fallen at the first hurdle. Probably a good thing I'm spending Christmas Day on a plane heading for a sunnier hemisphere then. With cold turkey sandwiches no doubt. Come on, let's be reasonable, MG. Battlestar Galactica? Don't give it up. How bad could it be for you? BSG can be bad for you in that it takes up time, it's soooo compelling. Cold turkey sandwiches, that´s good. I do love them, for San Esteban. Thanks so much for the link, btw.